Welcome Farkers! Well, everyone but aerojockey. Wow, some antiscience claims are so weird it’s a wonder anyone can take them seriously. 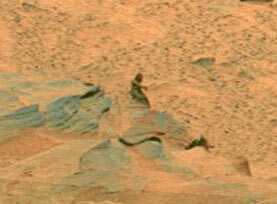 A man is in the photograph which the Mars explorer Spirit (it stopped transmitting data in 2004) sent. First, puhlllleeeeze. A man? It’s a tiny rock only a few inches high. It’s only a few feet from the rover! Here’s the image from NASA. As usual for antiscience nonsense, they point to a press release image with no indication of when it was taken, or what the original image is. There are thousands of Spirit images, and I have little desire to comb through them looking for this one (though it appears to be early in the mission; it’s still on the landing accouterments). Second, Spirit stopped transmitting data in 2004? Well, kinda. It did stop, but then it started again. We’re still getting good stuff from both the Spirit and Opportunity rovers on Mars. The blog post seems to phrase it that way on purpose, to make it sound like Something Mysterious Happened. Now, I don’t read Japanese, so this may be a misunderstanding on my part. Are they just pointing out something funny looking? Maybe. FWIW, the site appears to be about weird images and such. But I see so much of this, and there is no lower limit to the dumbosity of such claims, that it just makes sense to figure on the lowest common denominator. Anyway, the image itself is, of course, yet another example of pareidolia, our ability to see patterns in random shapes. That does look like a guy hanging out on Mars, enjoying the 0.01 Earth atmospheric pressure, the 98% CO2 air, the subfreezing cold, and of course, just being four inches tall. Martians are pretty short, it seems. And patient, given its pose. Tip o’ the tin foil beanie to BABloggee piotr slisz.